Along with thinking about Christmas card design, I am always on the look out for tree ornament ideas. This year I wanted to design something new and I was thinking outside the box looking for a different material. We had a roll of aluminum window screening left from our cement ball project and that got the wheels turning. I have designed an original set of tree or window ornaments out of this relatively inexpensive material in combination with red wooden beads. 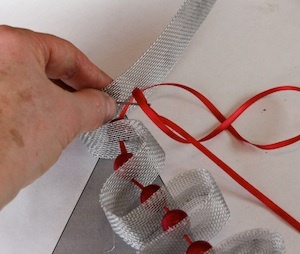 The first design is an Aluminum ribbon tree. 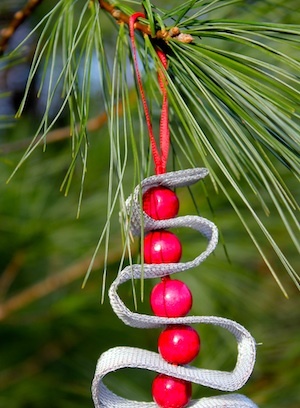 It is simple, inexpensive, quick to create and great materials to be placed among pine boughs. I like the contemporary feel. 1 piece aluminum window screening 2.5" w x 24" long - I purchased 1 roll of 36" x 84" bright Aluminum screening at Lowes. You can vary the size to create different sized ornaments. 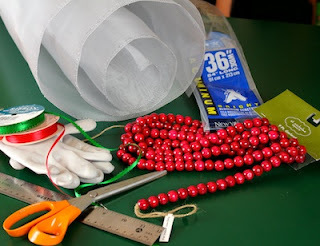 9 - 1/2" wooden red beads - I bought red bead garland and cut them off. 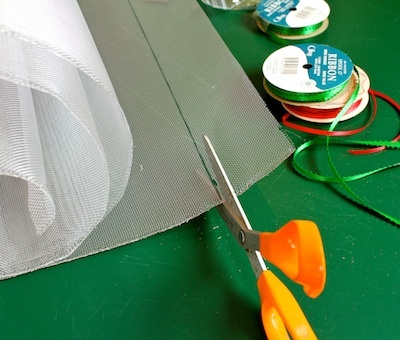 Measure a 2.5" strip of Aluminum screening. Use a permanent marker to mark it. Put on some thin gloves to protect your hands. 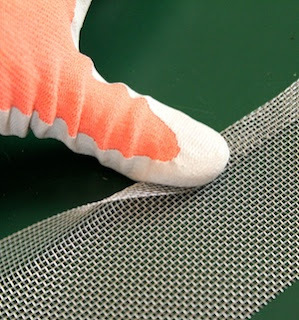 Using old, dull scissors cut the screening. Place the screen along a sharp edge (I used my desk surface) and bend back about 3/4". The desk edge helps create a straight line. 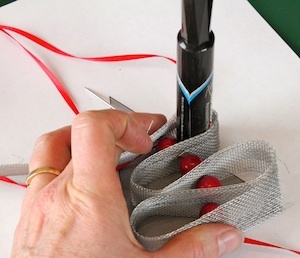 Use your thumb to fold it over and crease it in place. The aluminum bends very easily. I should have gotten gloves in a better color for these photos! Repeat the same process on the second side. 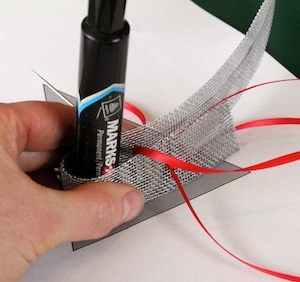 Your goal is to create a ribbon of aluminum about 1" wide with folded edges. Once the edges are folded over and creased you don't really need the gloves. 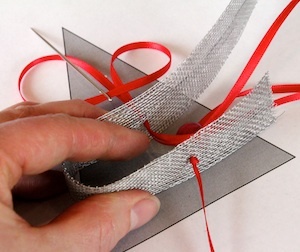 Thread the large darning needle with the red ribbon. 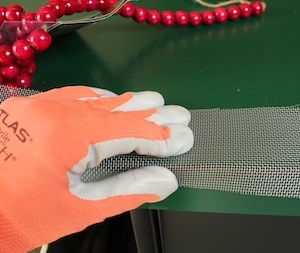 Thread the ribbon through the middle of the screening 1 1/2 " from the end of the screen. 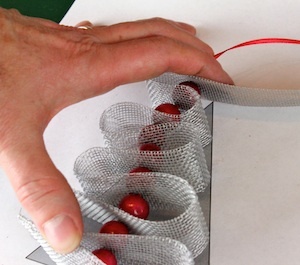 Place a bead over the needle and then thread the needle through the screen again. I used a marker to wrap the aluminum around. It helped me form a smooth curve. 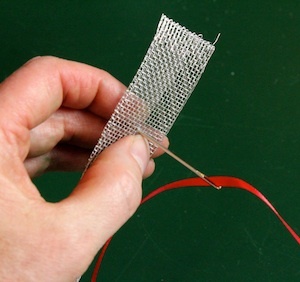 Continue threading the red ribbon through the screen, adding a bead, and thread through the screening again. 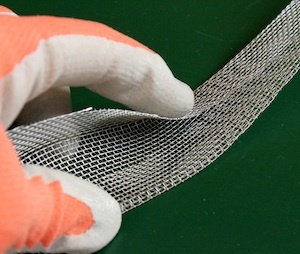 Each time use a round item to shape the screening. I used a smaller items as got closer to the top. I printed a triangle on a piece of paper measuring 3 1/2" across the base and 4 1/2" high to give me a guide in building the screening into a tree form. 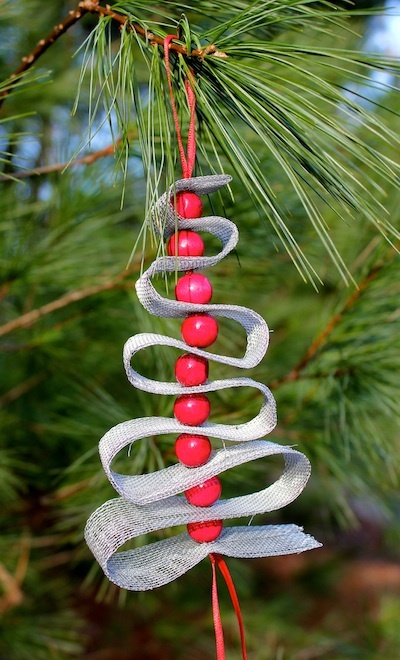 At the point your tree is the desirable height (I liked mine after 9 beads but it can vary), cut the extra screening off being sure to leave enough to fold under and finish the top edge. It is best not to leave raw screen edges. Thread the ribbon back down through all layers of screening and beads forming a loop at the top. You will tie a knot at the top and bottom as close to the screen as possible. This holds the entire tree tightly together. 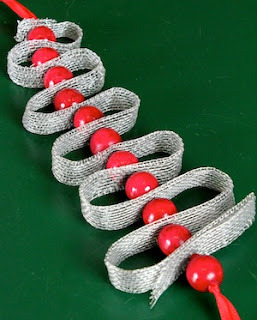 You can vary the width of the screen ribbon you create along with the number of beads to create many different tree screen ornaments. You can add a bead at the bottom, a star at the top, or just leave it as is - simple and contemporary. 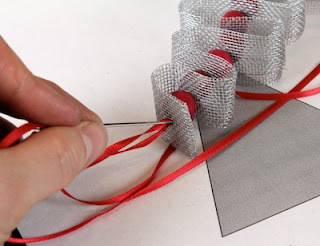 Return again over the next few days for other tutorials on other Christmas Tree Ornaments using aluminum screening. I have been busy!